Gastro Goodies? Ain’t nobody got time for that! Want some of the delicious treats you’ve been seeing in my blog in your own mouth? 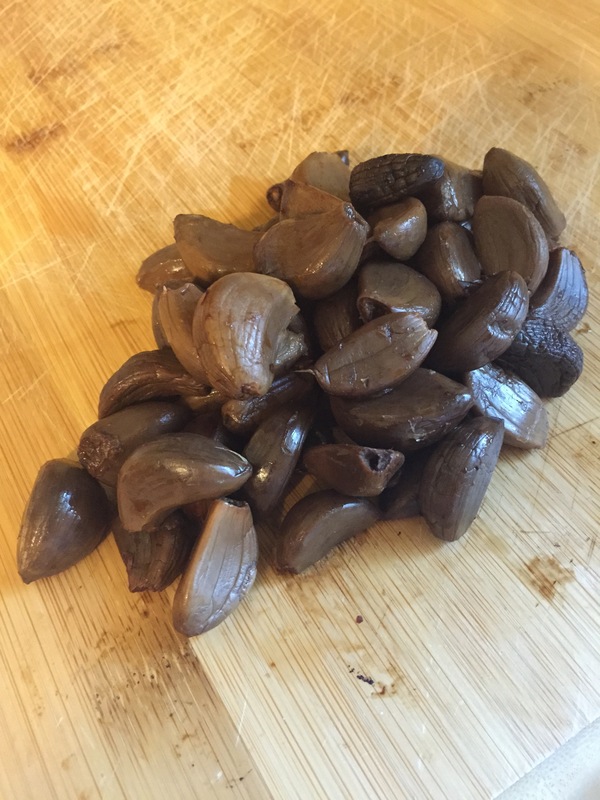 Check out my Etsy shoppe, Mise en Place Gourmet for 40-day-aged black garlic, hand-rolled truffles in 6 flavors, flavor-infused finishing salts, flavored sugars, and more! Hand made by me & delivered right to your door! You definitely have time for that!! I know, I know… it’s pumpkin-spice-everything time! But there’s a reason everyone goes loco for all things pumpkin & spice at this time of year… BECAUSE IT’S DELICIOUS! And not to toot my own horn or anything, but this is the tastiest flavored kombucha I’ve made to date. Real talk. Usually, what I do when I’m flavoring kombucha is do all the brewing & fermenting, then after the booch is filtered I will add some frozen fruit & let it sit on my counter in the jar with the lid loosened for another 24 hours. Usually I will end up with some secondary fermentation & a little fizziness. Some of my favorite flavors are peach & basil, black cherry, and mixed berry (cranberries, raspberries, and blueberries). This kombucha contains actual pumpkin, which is great for your eyesight, reducing “bad” cholesterol, and keeping your skin wrinkle-free! And it’s tasty too! In a small bowl combine pumpkin, brown sugar, and spices. Pour kombucha into a large pitcher. Add pumpkin mixture to kombucha & stir well to combine. 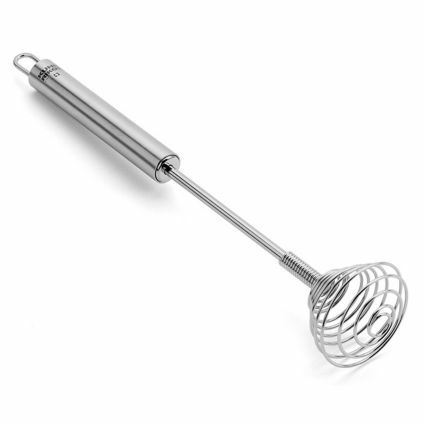 I used this type of whisk. Pour mixture into two 1-quart jars. Screw lids on loosely. Let jars sit at room temperature for at least 8 hours. 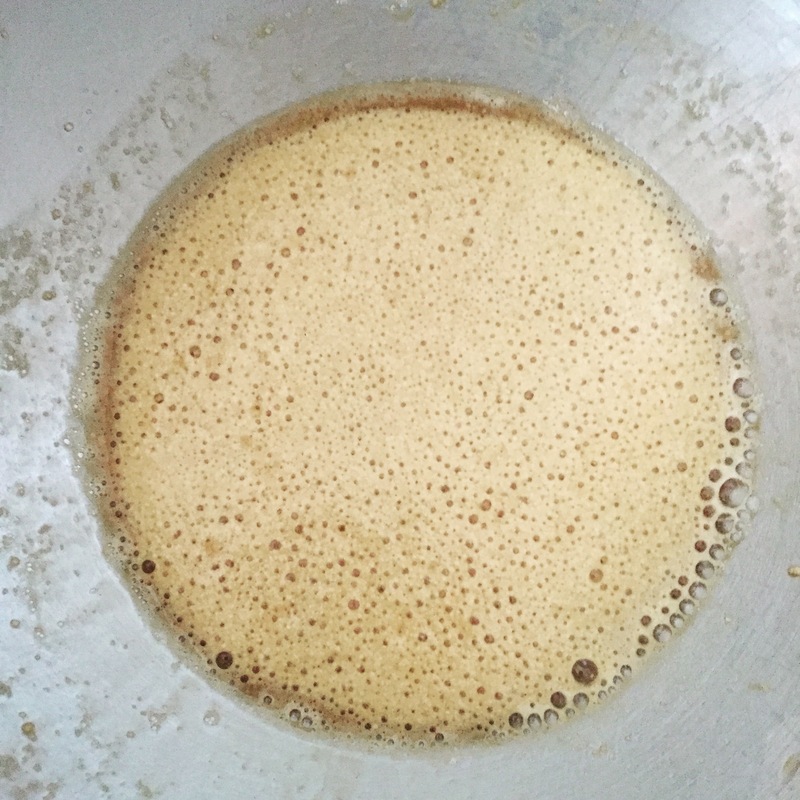 Before drinking you will need to shake your kombucha, as the pumpkin mixture will sink to the bottom. An alternative method is to place half the pumpkin mixture directly into two 1-quart jars of kombucha, put on the lids tightly & shake well. Then, loosen the lids and allow kombucha to sit at room temp for at least 8 hours before drinking. Earlier this week I was feeling some stress. My most favorite stress-reliever is baking bread. Something about working with my hands, dough stuck to all of my fingers, will always bring me to my happy place. Plus, when it’s over: FRESH BREAD! My go-to is this recipe, and as I am apt to do I made the loaves according to recipe the first time, and played a little the second go-around. Pour 1/2 C of the water into the bowl of a heavy-duty stand mixer. Sprinkle in the yeast & sugar, whisk to blend. Let the mixture rest for about 5 mins, until it’s nice & frothy. This is actually the froth with the molasses (darker color). Using a dough hook, add the remaining 2C of water, & about 3 1/2 C flour to the yeast mixture. Mix on lower speed until combined, then add 3 1/2 C more flour. Increase the mixer speed to medium, and scrape down bowl & hook as needed until the dough begins to come together. Add the salt, and knead on medium speed for about 10 minutes, until the dough is smooth and elastic. When the dough is mixed, add the butter, gradually, until incorporated. If the dough, begins to come apart here, don’t fret, keep kneading the dough & it will come back together. Shape the dough into a ball & place it in an oiled bowl. Make sure it is a large enough bowl, since the dough will double in size. Cover the bowl with plastic wrap and allow to rise for 1 hour. Grease 2 standard-sized loaf pans, and set aside. When the dough has risen you will want to punch it down to release the air, shape it into another ball, and split that in half, shaping each into a round shape with the edges tucked underneath. 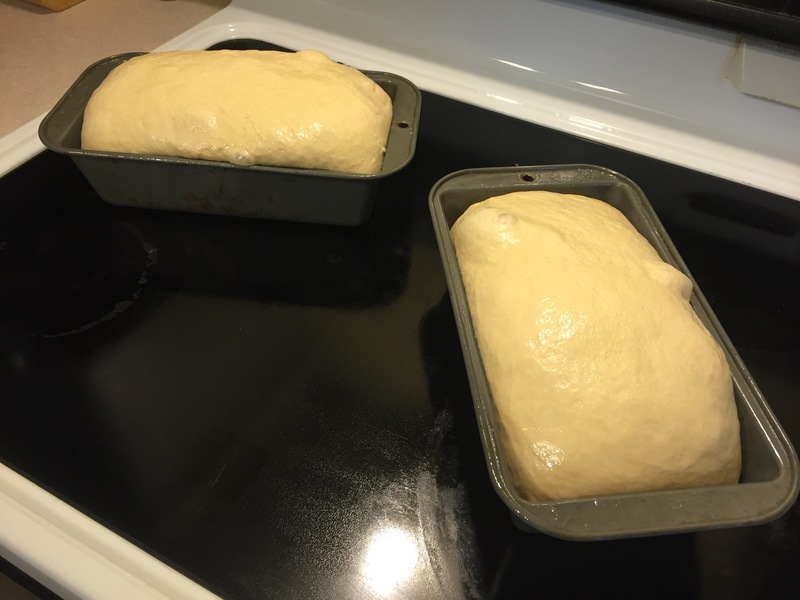 Place each loaf in a pan, cover with plastic wrap, and allow to rise for 1 hour a second time. While the loaves rise, preheat the oven to 375F. When the loaves have risen, bake for about 40 minutes until they are honey-brown and make a hollow sound when tapped. When I made my second round of bread, I used 1 tbsp of molasses in lieu of the sugar. It got frothy when mixed with the yeast, so I knew it was good-to-go for the bread rising. I did not find that this addition effected the flavor or color of the bread in any way. Other options to try include honey and agave nectar. 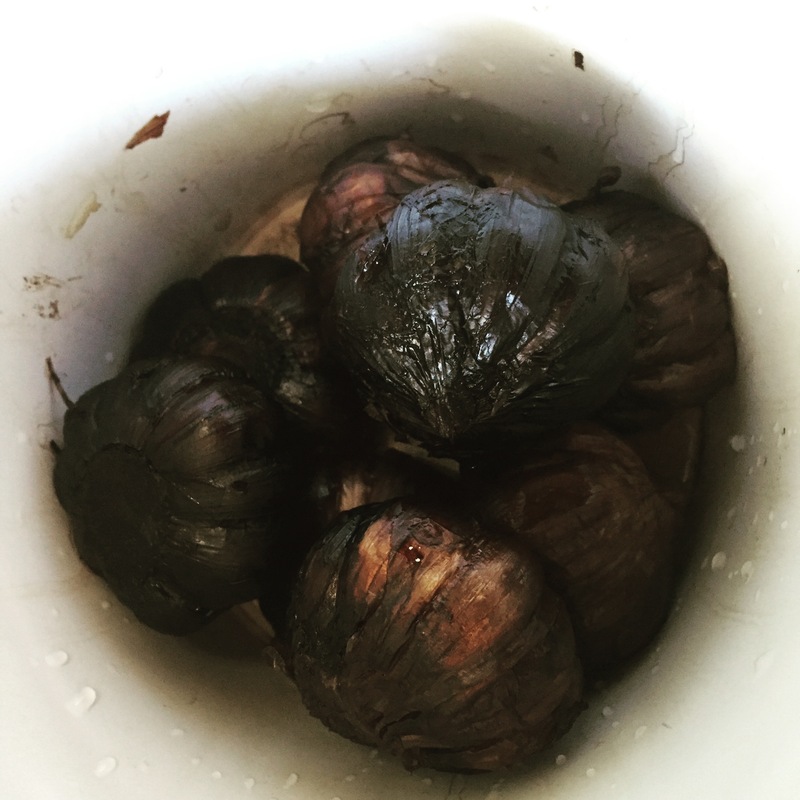 My journey making Black Garlic is complete! It took 39 days to get to earthy, fermenty perfection. The good news, is the garlic odor did not take over my house as I predicted it would… It would get stinky for a few minutes when I opened the crockpot & unwrapped it. My hands would definitely get pretty stinky when I rotated the cloves so the bottom ones would be on top & vice versa. At this point I started to peel the cloves. Here’s a pile of the little wrinkly babies… Aren’t they CUTE? This Black Garlic paste has a salty pungent taste, not unlike fish sauce. Seasoning with salt whenever you cook with garlic is a good idea. I find that the salt “sets off” the flavors in the garlic. That is especially true here. Process or blend until smooth. Use sparingly. A little bit goes a long way. In the bowl of a stand mixer, combine all ingredients. Mix using the paddle attachment until combined. Serve chilled with crackers or chips. 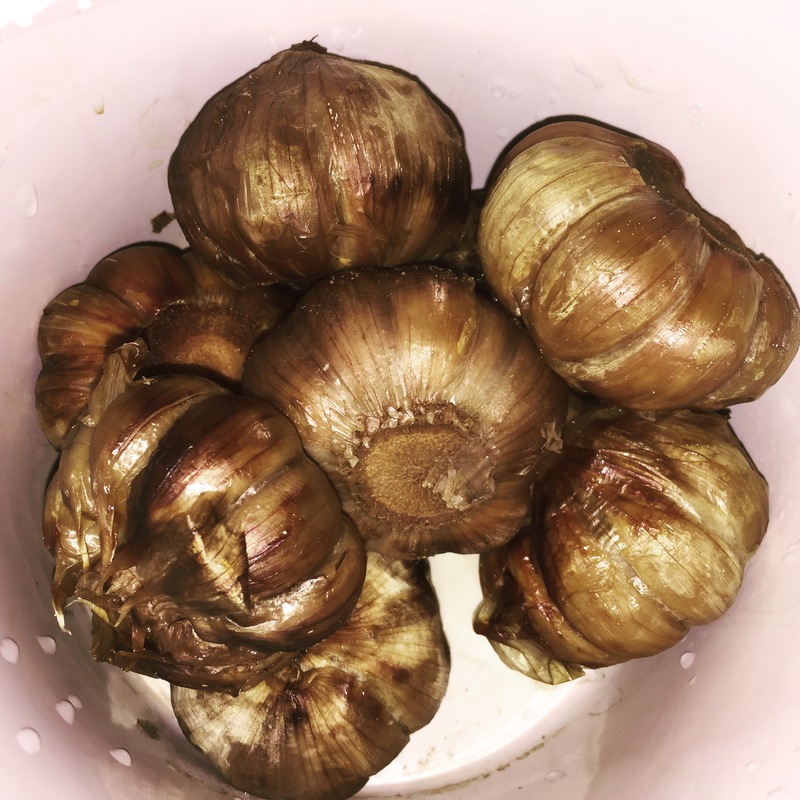 Black Garlic. It sounds so goth. But it’s supposedly Asian (Korea specifically) in origin and is the next stop on my fermented foods journey. But it’s going to be a long road. 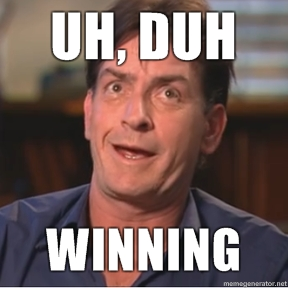 According to all the research I’ve done (Thank you Pinterest!) it can take anywhere from 14 to 40 days! And it will possibly stink up my house and need to be moved to the garage or outdoors. But it’s supposed to be healthy and have a rich, layered, smoky umami flavor. How will I know when it’s ready? I have no idea. But here we go! Do not peel the heads of garlic! In order for the magic to happen, they will need to be intact. Drizzle with your liquid of choice. You want to lock in the moisture so your heads don’t dry out and burn. Beer seems the best choice here, for moisture and imparting flavor. I’m using about 1/4 C for my 8 heads of garlic, just enough to moisten the bottom of the vessel. Cover with plastic wrap or foil or both. I’m putting the cover of the crockpot on there too. I think this is to a) keep the moisture contained and b) to contain the funky smell that’s liable to emanate while the garlic is fermenting. Keep at a constant temperature of 130F-150F for at least 2 weeks, leaving it in longer will result in a a deeper, smokier flavor. So there is a slight funk of garlic currently lingering in the house. It’s not BAD, the kids don’t even notice it, but if it gets worse I may have to move this operation to the garage.